77 short stories. Some as brief as 15 seconds! Great for sharing in those times when you need a quick story. These tales are gleaned from the world's folklore. Already they have proved their usefulness to tellers. 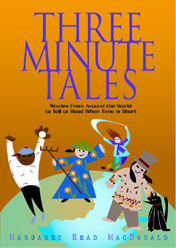 They are a favorite of my storytelling students and are fun to use as easy teaching tales. Quite possible to expand some of the meatier tales into much longer stories too, if you desire. "This book belongs on every storyteller’s shelf...ready to tell. An important book for any performer." ...Dan Keding, Sing Out!